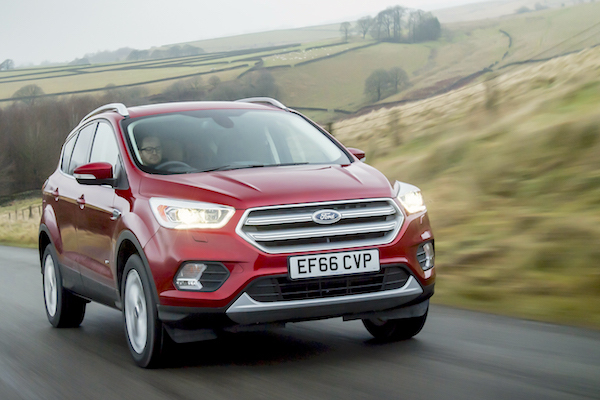 Ford Kuga sales surge 51% year-on-year in Hungary in September. Note the August 2018 post has now been updated with a YTD Top 50 models. After lurching up 45% due to pre-WLTP sales last month, the Hungarian new car market logically recedes 7.5% year-on-year in September to 8.888 registrations, yet the year-to-date tally crosses the 100.000 unit mark after just 9 months for the first time since 2008 at +26.5% to 104.618 units. As a reminder new car sales in Hungary fell to a paltry 54.165 units in 2010. Suzuki (-13%) reclaims the brands top spot it holds year-to-date, but for only 36 units with Ford (+31%) and Skoda (+54%) powering through in the remainder of the podium. Dacia (+46%) and Mercedes (#8) also shine in the Top 10 whereas Volkswagen freefalls 70% from #1 last month to #14 in September in true WLTP hangover form. Model-wise, for now we have access to a Top 20 SUV ranking year-to-date. It shows the Suzuki Vitara (-44%) drops harshly to just 5.3% share in September vs. 8.5% so far this year but the Ford Kuga (+51%) and Dacia Duster (+11%) show marked year-on-year gains. The Toyota C-HR shines in 5th place in the SUV segment with the new VW T-Roc (#13), Seat Arona (#15), Skoda Karoq (#17), Opel Crossland X (#18) and Hyundai Kona (#20) also strong. Full September 2018 Top 20 brands and YTD Top 60 models below.